Lakewood Lanes is the perfect venue for your next corporate event. Bowling enjoys widespread appeal – everyone can do it, and you don’t need to bowl like a Pro to have fun. Bowling also offers the advantage of being a year-round activity – you don’t need to wait for summer or worry about the weather ruining your event. Lakewood Lanes offers a clean, climate controlled environment, so your event can be planned for any season, any time of the year. And you’ll find all the equipment you need to bowl, including state-of-the-art computerized scoring equipment. What an amazing team-building opportunity, for small and large groups alike! 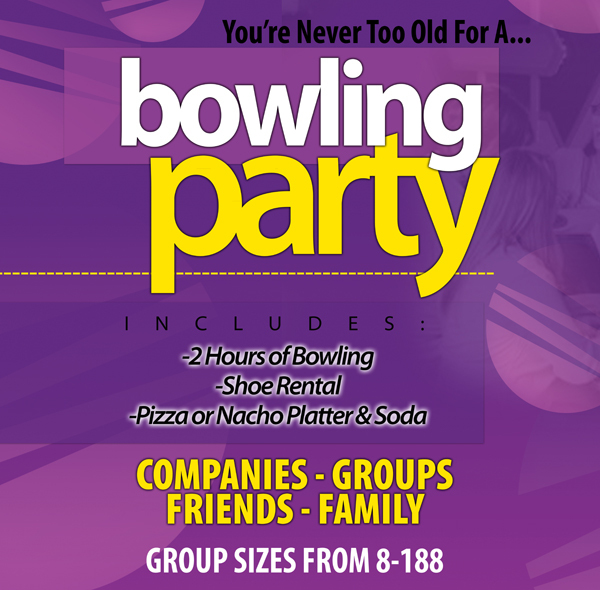 Customize your party: Take elements from other packages, add more games or time, upgrade your food or beverages, request special entertainment, arcade game cards, or book your event during our Galaxy Bowling times. Our Event Host will be glad to give you options you have not imagined. No one sits on the bench during our Company Events. Want information on upcoming available times? Feel free to send us an email or call (203) 574-5131 and one of our Event Planners will assist with Booking Time Options and Customized Party Planning. To help us research your event include what type of party you may be interested in, how many guests you expect, and your preferred dates.